I'm not ready to stop wearing my white skinnies. Actually, I tend to wear them throughout the entire year. By pairing your white skinnies with seasonal items, they will work for you all year too. 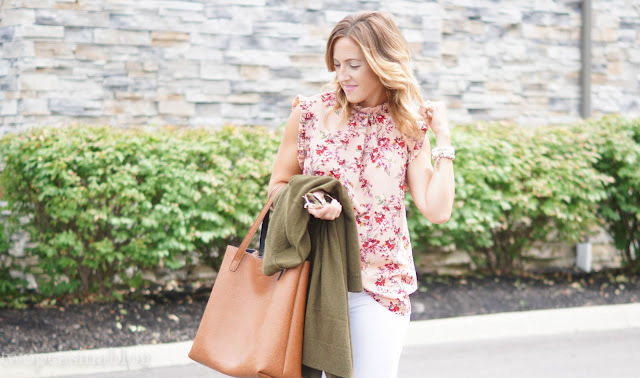 This soft feminine floral blouse is the perfect transition piece. It has hints of Fall while being light and breezy for the warm days. I bought this blouse during the Nordstrom Sale. It has sold out a couple times since then and has been re-stocked - it's that good! 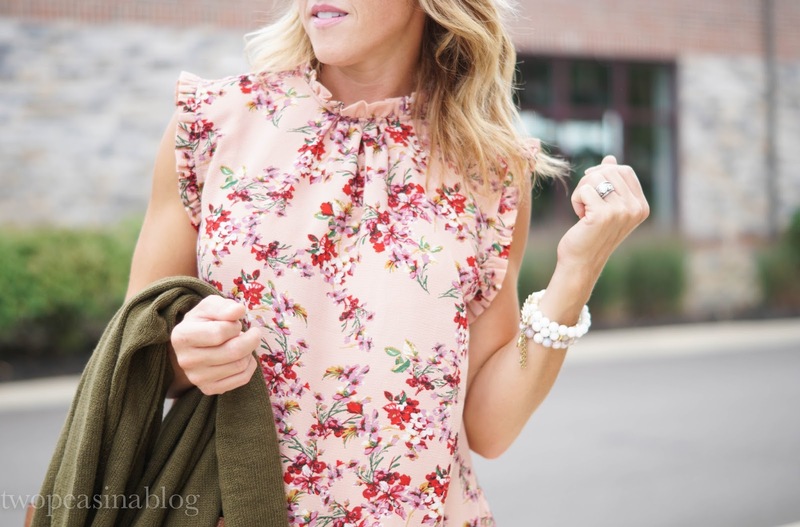 Here is another similar floral blouse that is also perfect for Fall layering. Speaking of Fall layering, everyone needs a couple soft cardigan sweaters in their closet. This cardigan comes in a few colors, has a perfect long length, and it has pockets! The kiddos started back to school on Wednesday, so mornings have been a little crazy trying to get back on schedule. We've got one in middle school, one in elementary, and one in preschool. Three different start times make for interesting mornings. Loving the floral top with the white pants! Love the blouse..it's so feminine! And I can't imagine how chaotic your mornings must be with your kids! I wear my white skinnies year round!!! This is such a cute look! Katey, I am so crushing on that cardigan! I love the length, the color, and it looks so soft and cozy. And the perfect layering piece for fall. It looks fabulous with the pretty floral top, too. I totally plan on wearing my white skinnies throughout the year as well! 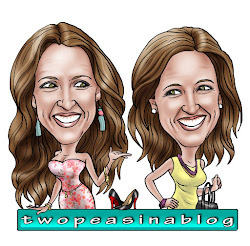 Thanks for linking up with me On the Edge of the Week. I hope to see you again at this week's link up. Have a fabulous day! This top... OMG! So pretty! You are so right in saying that this top will transition well into fall. I love the neckline and the colors are absolutely stunning! Thanks for linking up at Grace + Lace!